Reading and share top 32 famous quotes and sayings about First Meetings by famous authors and people. Browse top 32 famous quotes and sayings about First Meetings by most favorite authors. 1. "When I was 12 and met my real father for the first time, I was terrified I would lose the one I already had." 2. 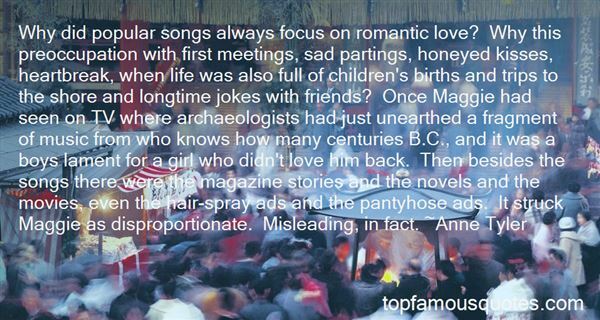 "Why did popular songs always focus on romantic love? Why this preoccupation with first meetings, sad partings, honeyed kisses, heartbreak, when life was also full of children's births and trips to the shore and longtime jokes with friends? Once Maggie had seen on TV where archaeologists had just unearthed a fragment of music from who knows how many centuries B.C., and it was a boys lament for a girl who didn't love him back. Then besides the songs there were the magazine stories and the novels and the movies, even the hair-spray ads and the pantyhose ads. It struck Maggie as disproportionate. Misleading, in fact." 3. "People speak of fateand meetings of chance.Finding of soul matesand love at first glance.Alignment of planetsShooting stars up above.Fullness of the moonand pairs of white doves.I've never taken stockin these symbols and signs.But having met youproved I'd been blind.Poets write of heartseternal devotion.Flames of desireand new found emotion.Love ever lastinga lifetime of bliss.Heaven here on Earththe passion of a kiss.I've never found validthese words foolishly penned.Then you graced my presenceand proved me wrong again.Singers sing of heartacheand the one that got away.Internal emptinesspain that still remains.Missed opportunitiesthe hollowness of night.Paths that never crosstiming that wasn't right.I never dreamed those songscould ever ring so true.Until I thought of lifewithout ever knowing you." 4. "But there must be a real giving up of the self. You must throw it away 'blindly' so to speak. Christ will indeed give you a real personality: but you must not go to Him for the sake of that. As long as your own personality is what you are bothering about you are not going to Him at all. The very first step is to try to forget about the self altogether. Your real, new self (which is Christ's and also yours, and yours just because it is His) will not come as long as you are looking for it. It will come when you are looking for Him." 5. "Anyone who would let Gary Cooper and the entire cast go charging on horseback without first finding out what kind of footing the horses had is nuts and cannot possibly direct a motion picture." 6. "I? I am the wind,' said Thowra. ‘I come, I pass, and I am gone.' The strange feathers moved up and down, the strange voice said tartly: ‘And are your sons the same?' ‘My son is the lightning that strikes through the black night. My grandson is light that pierces the dark sky at dawning.' ‘Ah,' said the first emu, ‘and we know your daughter is the snow that falls softly from above and clothes the world in white. You want but the rainbow — that is and was and never will be, and is yet the promise of life — and the glittering ice which is there and is gone: then you and your family will possess all magic." 7. "If a dog doesn't put you first where are you both? In what relation? A dog needs God. It lives by your glances, your wishes. It even shares your humor. This happens about the fifth year. If it doesn't happen you are only keeping an animal." 8. "A first meeting. A meeting in the desert, a meeting at sea, meeting in the city, meeting at night, meeting at a grave, meeting in the sunshine beside the forest, beside water. Human beings meet, yet the meetings are not the same. Meeting partakes in its very essence not only of the persons but of the place of meeting. And that essence of place remains, and colours, faintly, the association, perhaps forever.Ethel Wilson, Swamp Angel. Toronto: McClelland and Stewart, 1990 (page 95)." 9. "We all have chance meetings with people, even with complete strangers, who interest us at first glance, suddenly, before a word is spoken." 10. "God has such gladness every time he sees from heaven that a sinner is praying to Him with all his heart, as a mother has when she sees the first smile on her baby's face." 11. "But the real enemy is the cold. It steals up on you quieter than Will, and at first you shiver and your teeth chatter and you stamp your feet and dream of mulled wine and nice hot fires. It burns, it does. Nothing burns like the cold. But only for a while. Then it gets inside you and starts to fill you up, and after a while you don't have the strength to fight it. It's easier just to sit down ot go to sleep. They say you don't feel any pain toward the end. First you go weak and drowsy, and everything starts to fade, and then it's like sinking into a sea of warm milk. Peaceful, like." 12. "The remedy for most marital stress is not in divorce. It is in repentance and forgiveness, in sincere expressions of charity and service. It is not in separation. It is in simple integrity that leads a man and a woman to square up their shoulders and meet their obligations. It is found in the Golden Rule, a time-honored principle that should first and foremost find expression in marriage." 13. "Kumiko and I felt something for each other from the beginning. It was not one of those strong, impulsive feelings that can hit two people like an electric shock when they first meet, but something quieter and gentler, like two tiny lights traveling in tandem through a vast darkness and drawing imperceptibly closer to each other as they go. As our meetings grew more frequent, I felt not so much that I had met someone new as that I had chanced upon a dear old friend." 14. "...Men do not sufficiently realizethat their future is in their own hands.Theirs is the task of determining first of all whether they want to go on living or not.Theirs is the responsibility, then, for deciding if they want merely to live,or intend to make just the extra effort requiredfor fulfilling, even on this refractory planet,the essential function of the universe,which is a machine for the making of gods." 15. "The only true love is love at first sight; second sight dispels it." 16. "Autumn seemed to arrive suddenly that year. The morning of the first September was crisp and golden as an apple." 17. "THE ALLURE OF Montana is like a commitment to a narcotic; you can never use it up or get enough of it. Its wilderness areas probably resemble the earth on the first day of creation." 18. "If indeed it's a raceThen the chicks do the mostIt isn't a bragOr an estrogen boastIt's the women who've led meWith big open heartsIf not for their loveI'd have failed at the start.And it's not just the mothersI speak of them ALLIt's a woman there first When somebody falls.The multi of taskingThat's easy to teaseI dare a great manTo try it all, PLEASE!So this is my shout outMy rallying cryTo women all overI hold you up highAnd though there are othersWho'll think this poem strangeIt's the women who plantThe root of big change." 19. "He invented stories so fantastic she had to believe. Of cours, she was only a child, still removing the dust from her first death. What else could she do? And he was already accumulating the dust of his second death. What else could he do?" 20. "The first kiss between two people is something really good in life." 21. "How'd this happen?" Melody asked in a stunned whisper. She never expected to fall in love and certainly not this swiftly or with this much finality. "We just met. ""I don't believe that," Clay argued as he turned her palm over in his and traced the lines of it with the pad of his finger. "I'm pretty sure we've known each other forever. Seeing you the first time was like coming home, and there ain't been anything to happen since that's disabused me of the notion. ""Yeah," Melody agreed, the bright skyline blurring to a sea of vibrant color. She remembered seeing Clay in Hal's Diner the first time. Alone and eating his turkey, she'd been compelled to reach out to him. "Do you really believe in soul mates? ""I do now." 22. 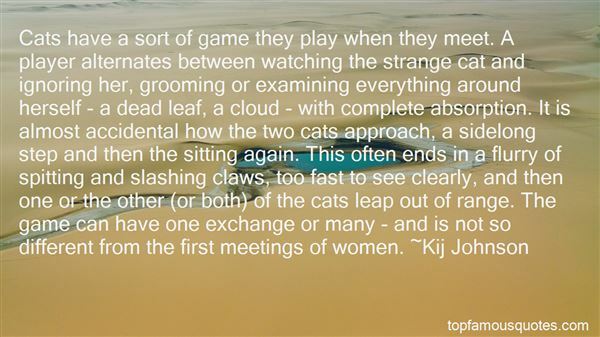 "Cats have a sort of game they play when they meet. A player alternates between watching the strange cat and ignoring her, grooming or examining everything around herself - a dead leaf, a cloud - with complete absorption. It is almost accidental how the two cats approach, a sidelong step and then the sitting again. This often ends in a flurry of spitting and slashing claws, too fast to see clearly, and then one or the other (or both) of the cats leap out of range. The game can have one exchange or many - and is not so different from the first meetings of women." 23. "A Christian mother's first duty is to soil her child's mind, and she does not neglect it. Her lad grows up to be a missionary, and goes to the innocent savage and to the civilized Japanese, and soils their minds. Whereupon they adopt immodesty, they conceal their bodies, they stop bathing naked together." 24. "I saw my first two Broadway shows when I was 4 years old, 'The Lion King' and 'Beauty and the Beast,' and after both of them I came home and reenacted the entirety of the shows on my living room table for my family and friends. I started doing that after every show I saw until I actually did my first youth production when I was 5." 25. "I remember the thrill that was mine when, in one of my first meetings, I led my first soul to Christ in America. And he was one of my own countrymen." 26. "Olivia Newton-John was our first choice to play Sandy, but she was nervous about acting, whether she would feel comfortable with us and could pull it off at all." 27. "I was in my office when - on 9/11. I think I had a number of meetings scheduled. I was just getting to know the bureau. And somebody walked in and said the first plane had - or a plane had struck the World Trade Center, one of the towers." 28. "First, we should not be opening our coasts, all of our coasts, to oil drilling when we have not taken the first step, not the first step, to conserve oil." 29. "A serious prophet upon predicting a flood should be the first man to climb a tree. This would demonstrate that he was indeed a seer." 30. "Theirs was that substantial affection which arises (if any arises at all) when the two who are thrown together begin first by knowing the rougher sides of each other's character, and not the best till further on, the romance growing up in the interstices of a mass of hard prosaic reality." 31. "Growing up in Memphis and listening to all kinds of music and dreaming... So that was one of the first times I wrote a complete song and set it to music and the whole bit. From then on, I was busy with it." 32. "I am glad I have found this napkin.This was her first remembrance from the Moor,My wayward husband hath a hundred timesWooed me to steal it, but she so loves the token— For he conjured her she should ever keep it— That she reserves it evermore about herTo kiss and talk to. I'll ha' the work ta'en out,And give't Iago. What he will do with it,Heaven knows, not I.I nothing, but to please his fantasy." A few months ago, I was sitting morosely at my desk, wondering why I had ever agreed to review Barbara Bush: A Memoir for an English newspaper. The experience was proving to be a degradation of the act of reading. Imagine, if you will, being strapped into a chair and made to listen to Liberace playing the piano for hour upon hour. Or imagine being fed chocolate dinner mints, like a hapless goose, until you are on the verge of explosion. Such was my lot."